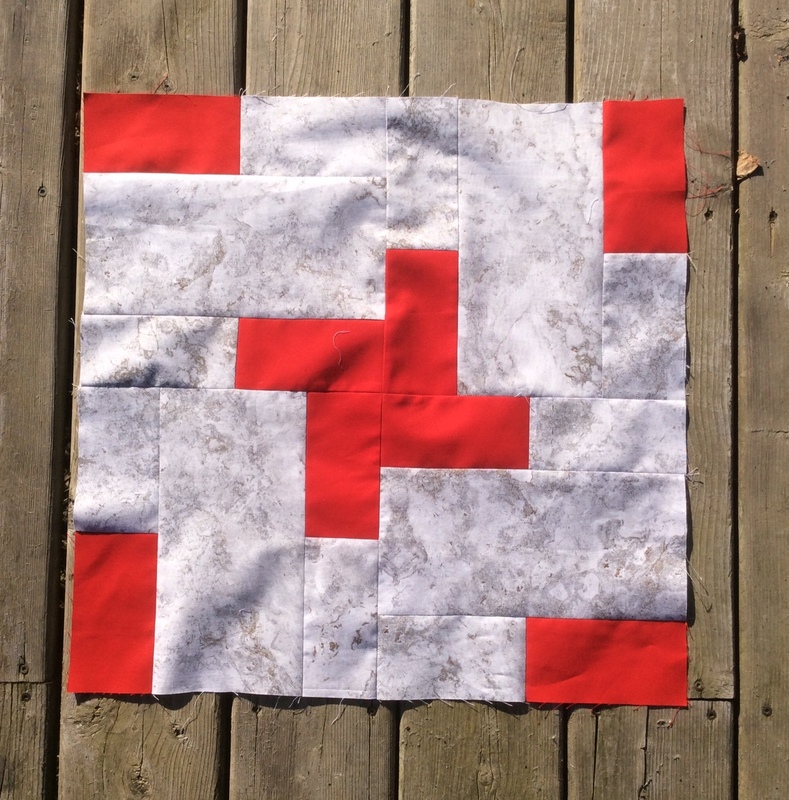 I hope you are continuing to enjoy this worthwhile and fresh Quilt Along. By combining our love of quilts with a valuable fundraiser many dollars are going to St. Jude Children's Research Hospital. Donations are voluntary but every little bit helps and all donations add up. I enjoy using my Bloc-Loc rulers for the tiniest bit of squaring up that I am doing. Once you use them for squaring up you will wonder where they were all your quilting life. As month four starts the block we are making is titled Coconut Cross. If you are using the Fat Quarter shop kit with the beautiful Mama's Cottage fabric by April Rosenthal we have a couple of new prints and a couple of returning prints. I hope you are continuing to follow Carla at Creatin' in the Sticks (here) and her guest bloggers for her 30 blocks in 30 days adventure. We are almost halfway through April so a block called Median Strip is a good choice for the midway point. Here are the block components. 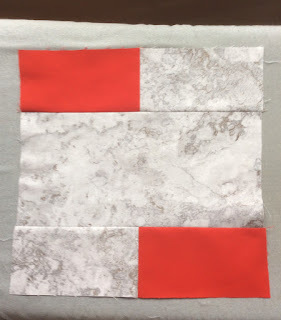 Four rectangles that are 3" by 5 1/2" and one rectangle that measures 5 1/2" by 10 1/2"
The shorter rectangles are stitched together on their short ends and then added to either side of the median rectangle. Make certain your colour sections are at opposite ends. Single block, note position of colour rectangles. 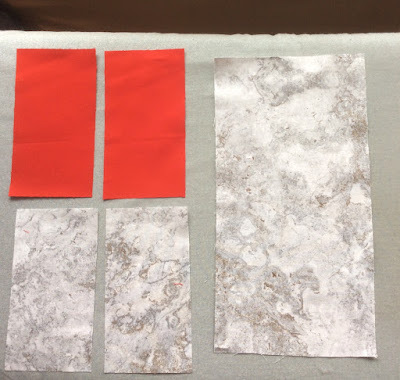 Once you have your sample block complete the decision making can really begin. Do you want to make one to continue the one a day theme? 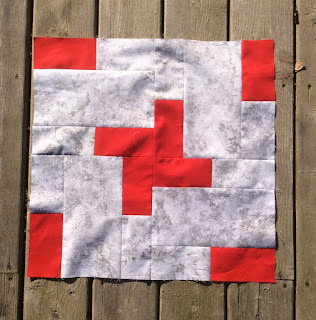 Do you want to make an entire quilt from this block? 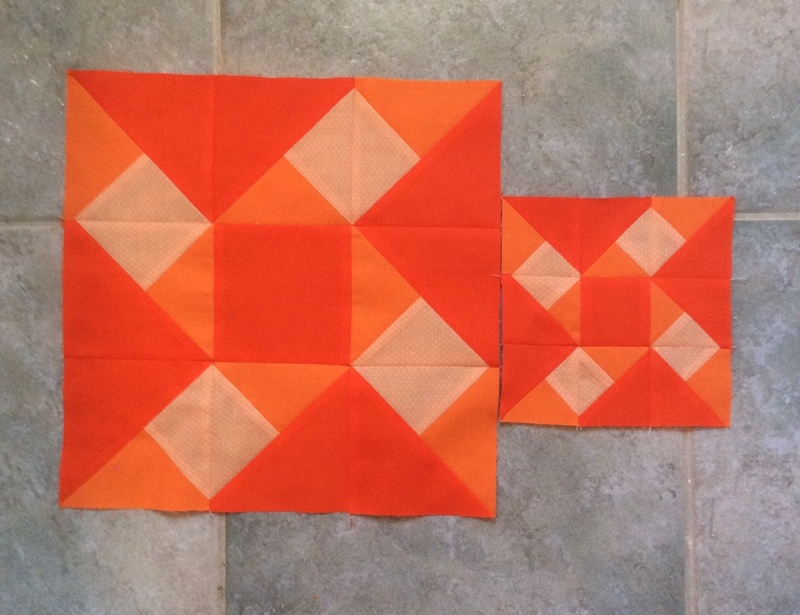 If you decide on one quilt the colour decisions come next. 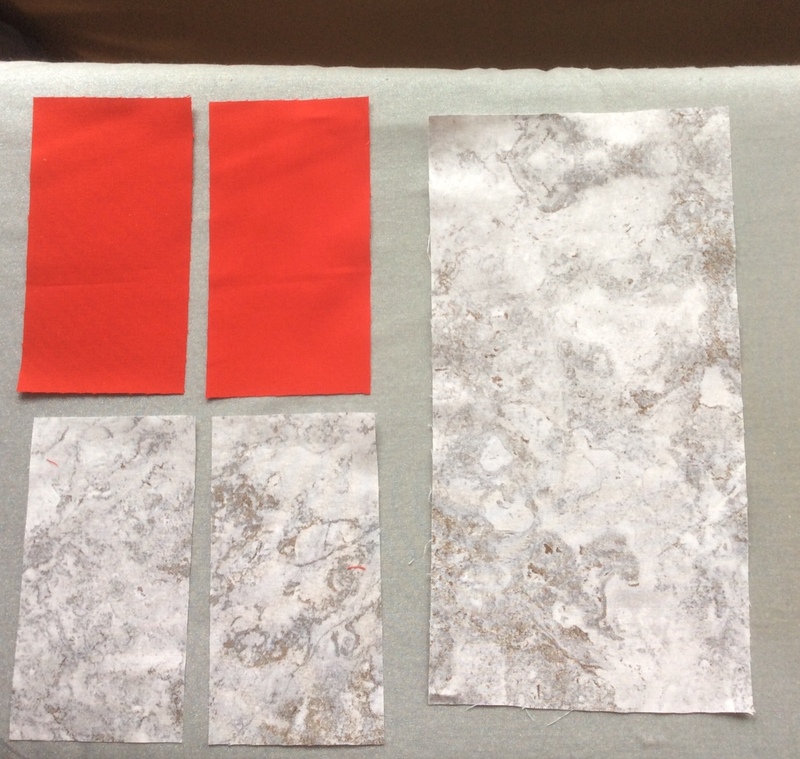 With a consistent background this could easily become a scrap quilt, or you could make a two colour quilt, or a rainbow of colours. I put four blocks together to see what they would look like as they are rotated. This is a very easy block to assemble and with no seams to match pressing direction is not an issue other than to make certain you do press each seam as you go. I hope you continue to follow along and visit the other bloggers who are chiming in on this terrific project. the following is a list of who is participating. 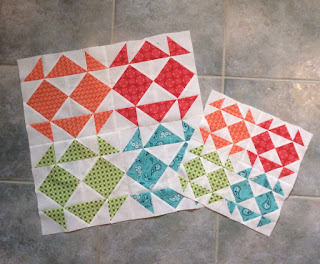 Jen is back again with some more blocks for April. This month the colour is orange. Often not a popular colour with some people. When my son was in grade 7 or 8 he came home from school one day very disgruntled because his class had been assigned orange for colour day. His comment was who wears orange? His teacher showed up for the assembly with orange fabric to tear into strips so anyone without orange to wear could have an orange tie. She was a gem. For my block I found what looked like a light, medium and dark orange and constructed the block. In its photo above I am not certain the differences are that clear. Should I blame my camera and not my eye for colour?